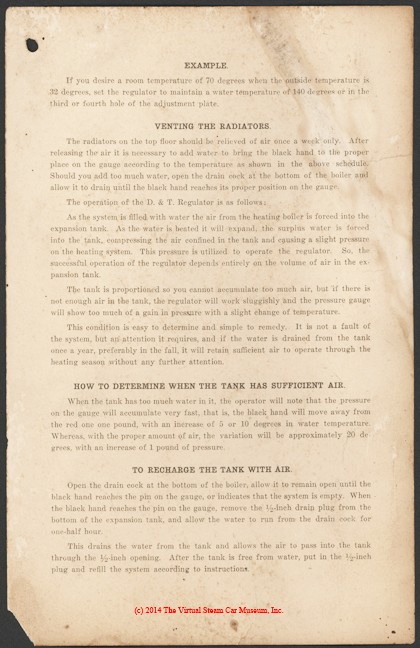 This web page took thirty to forty hours to scan, research, and design. Thank you for supporting the Virtual Steam Car Museum! This steam car was more fancy than fact, although roadster and touring models, and also a truck, were produced about 1921. 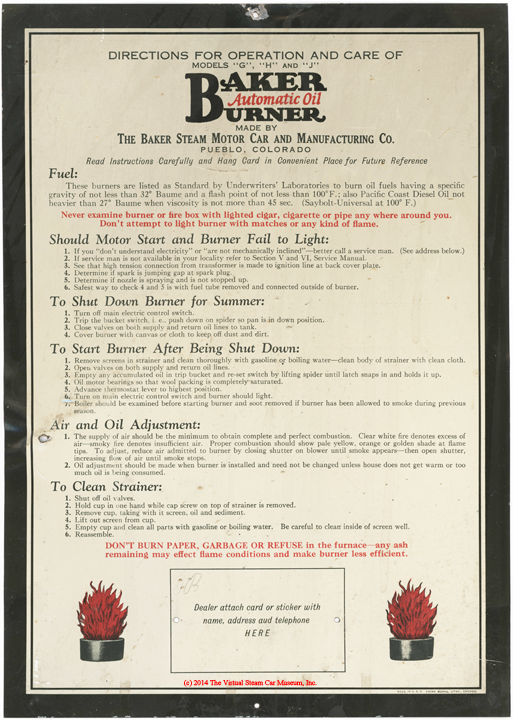 Baker boilers, designed by Dr. H. O. Baker, were used successfully, however, as replacements on Stanley cars. 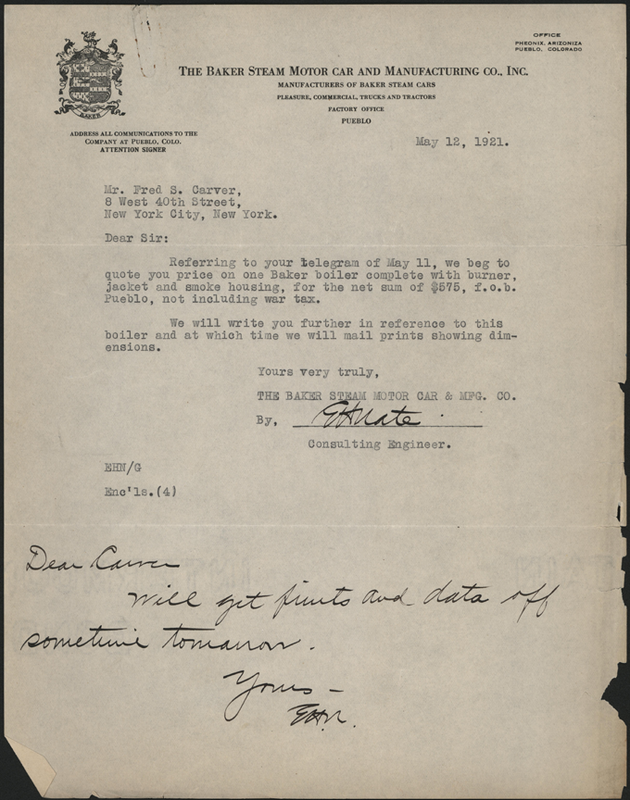 E. H. Nate wrote to Fred Carver on May 12, 1921 concerning a boiler. Nate promised to "get prints and data sometime tomorrow." John A. Conde Collection. 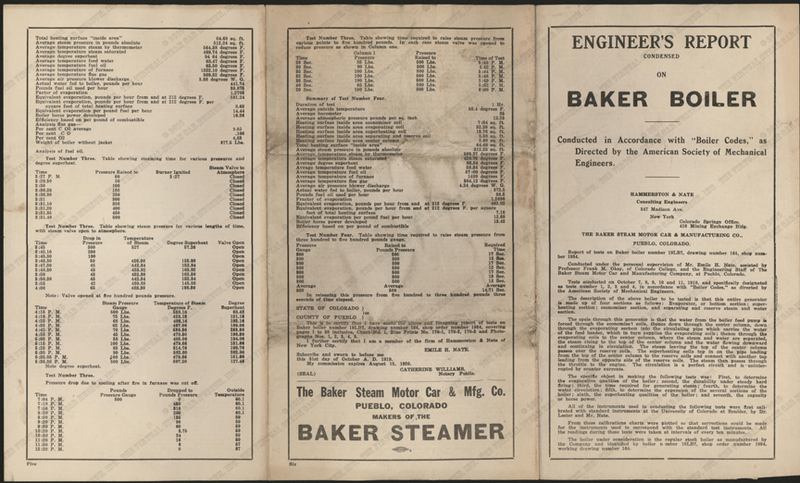 Baker produced this 32 page brochure to promote his steam car and its technology. This copy was mailed to J. B. Paddleford, Route #1, Yakima, Washington in 1922. 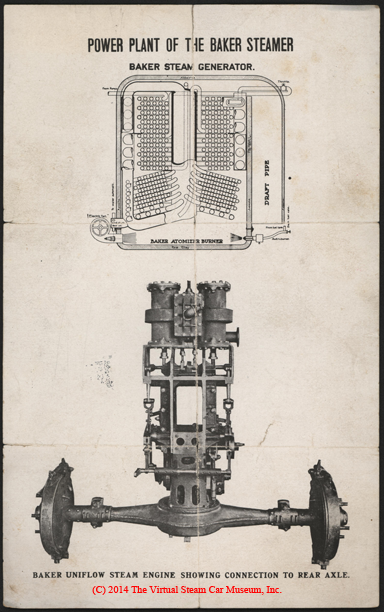 This undated single sheet flyer shows the Power Plant of the Baker Steamer, the Baker Steam Generator, and the Baker Unmiflow Steam Engine Showing Connection to Rear Axle. 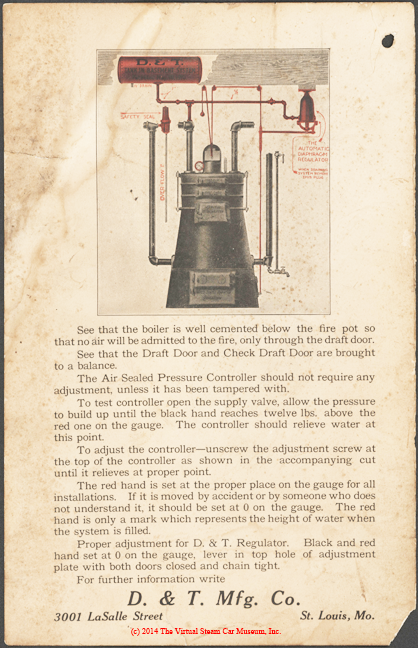 It is associated with the stock brochure entitled The Baker Steamer: The Motor Triumph of the Age below. 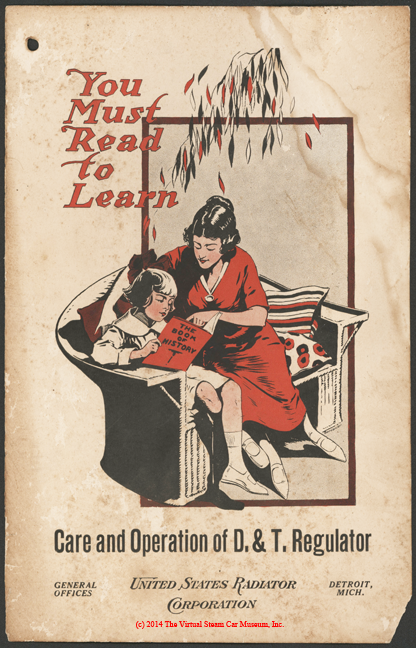 This undated brochure is associated with the flyer above. 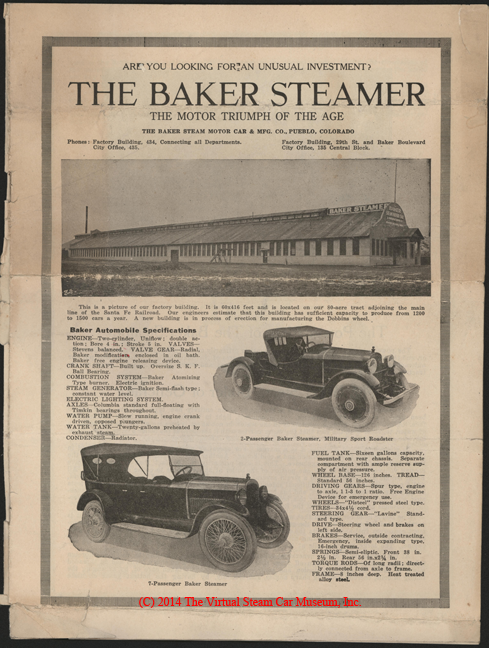 It is entitled The Baker Steamer: The Motor Triumph of the Age below. A second copy, dated 1921 by John A. Conde, was acquired by Conde in July 1971 from "Meikel $10.00 TR." John A. Conde Collection. 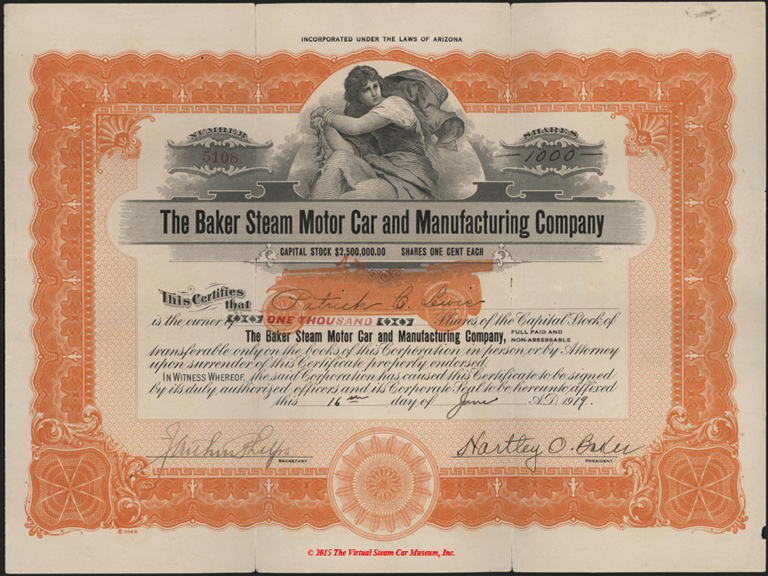 This undated Baker Steam Motor Car brochure carries two stamps on its fron tcover. THe first is for Edward A. Rolston, the Local Agent in Laoiede Rms. Lamar, ColO. 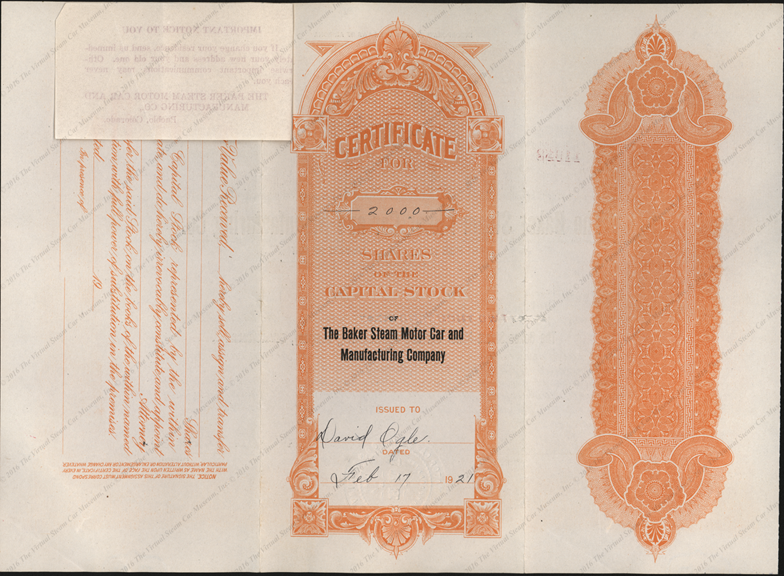 The other stamp notes that the Stock [is] now selling at 3c. Will advance on or before Feb. 16th. 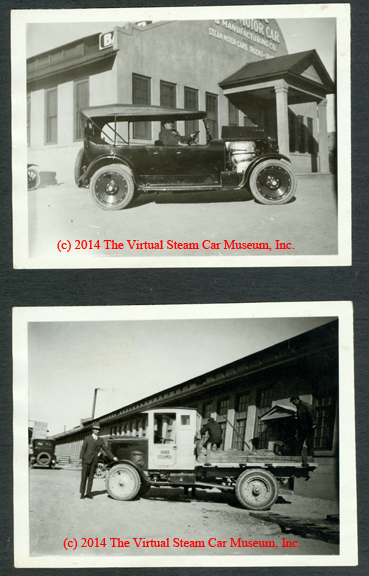 These undated photographs were taken outside the front of the Baker factory in Pueblo, CO. One shows the automobile and the other a flat bed truck. 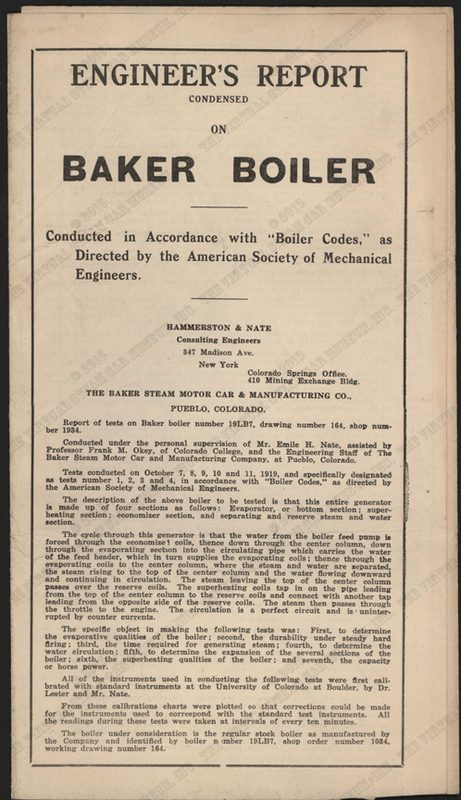 Mr. G. W. Nichols owned two copies fo the "Engineer's Report Condensed on [the] Baker Boiler, produced by the Baker Steam Car and Manufacturing Company on October 31, 1919. Nichols Collection. 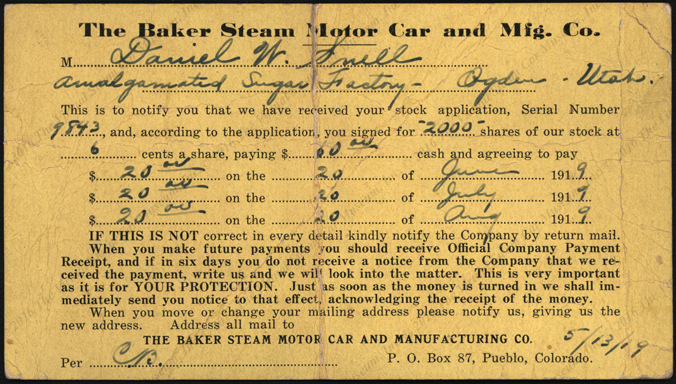 Daniel W. Snell of the Amalgamated Sugar Factory in Ogedn, Utah bought 2000 shares of Baker Steam Motor Car stock for $.06 per share on May 13, 1919. 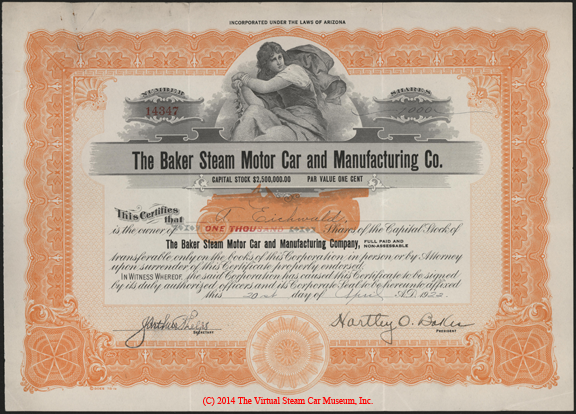 Patrick B. Lewis purchased 1,000 shares of Baker Steam Motor Car and Manuracturing Company stock on June 16, 1919. 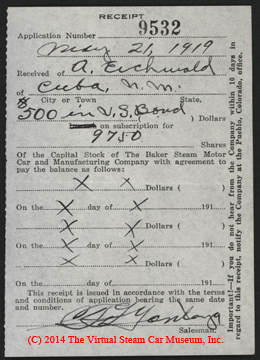 A. Eichwald or Cuba, New Mexico apparently exchanged a $500 bond for 9,750 shares of Baker Capital Stock on May 21, 1919. 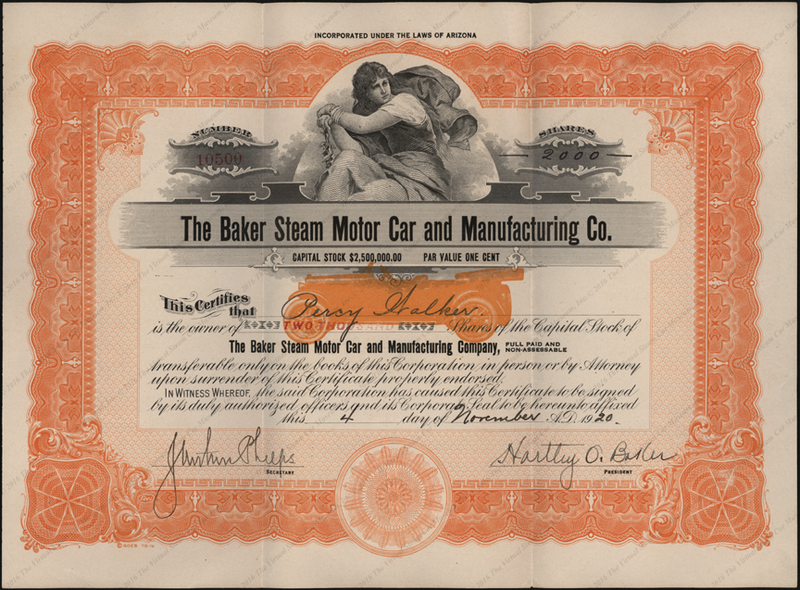 H. C. Foon paid $150 on February 7, 1922 for one unit of Baker Steam Motor Car and Manufacturing Company Capital Stock. 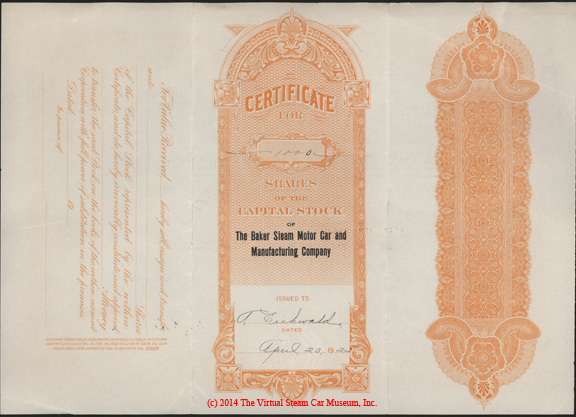 This is A. Eichwald's stock certificate for 1,000 shares of Capital Stock in the Baker Steam Motor Car and Manufacturing Company. Eichwald's stock was sent via registered mail. 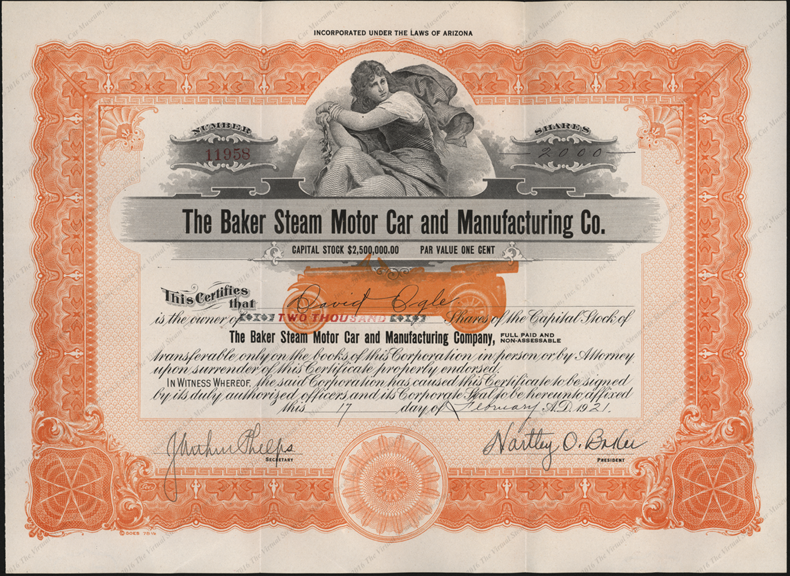 Percy Walker purchased 2,000 shares of the Baker STeam Motor Car and Manufacturing Company on November 4, 1920. 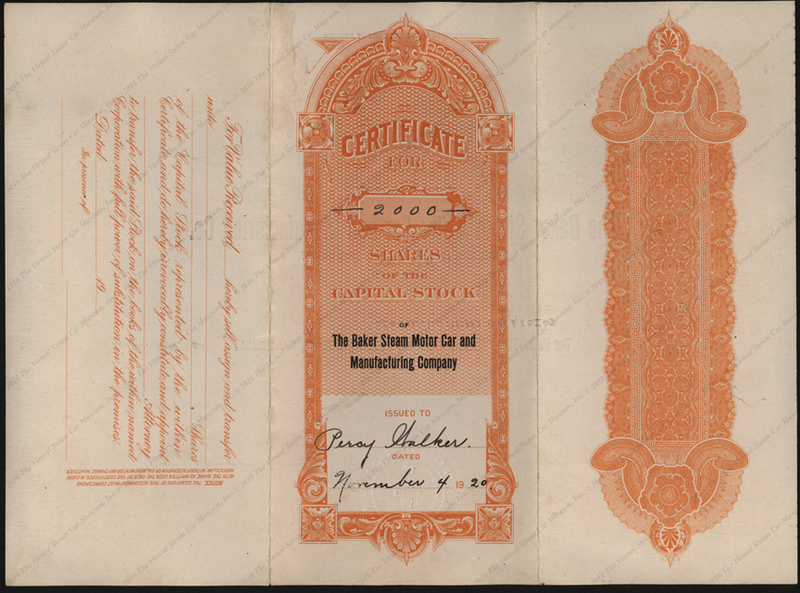 An instruction sheet telling him to clip his coupon and mail it back has survived with his stock certificate. 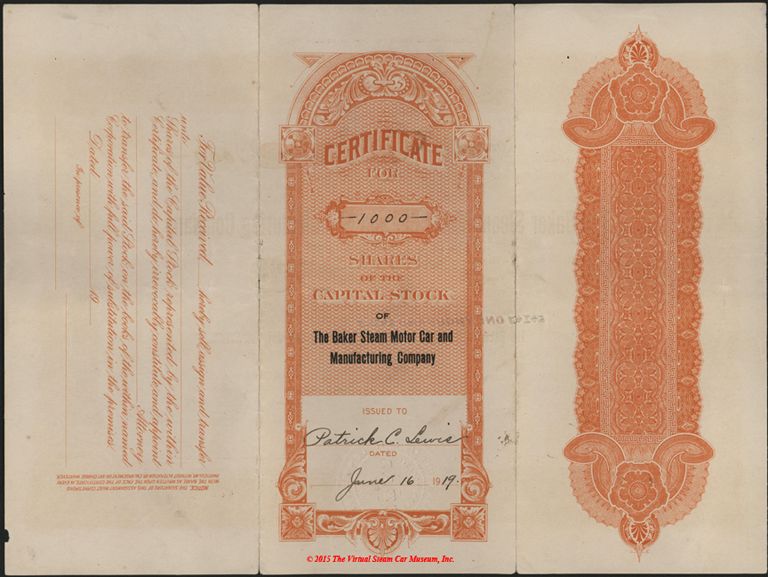 David Ogle's stock certificate carried a change of address note. February 17, 1921. 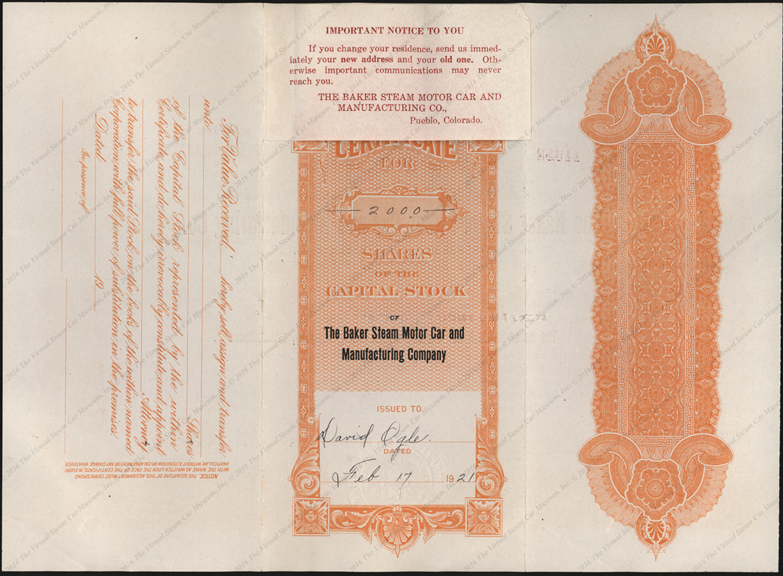 Leroy O'Dolan received this $.50 dividend check from the Baker Steam Motor Car Company, dated January 28, 1922. 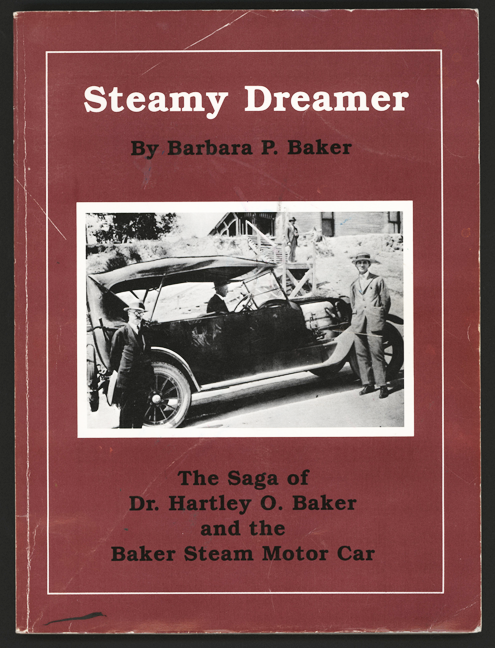 Barbara P. Baker's, Steamy Dreamer: The Saga of Dr. Hartley O. Baker and the Baker Steam Motor Car, tells the story of Baker and his steam car. This book is apparently out of print. 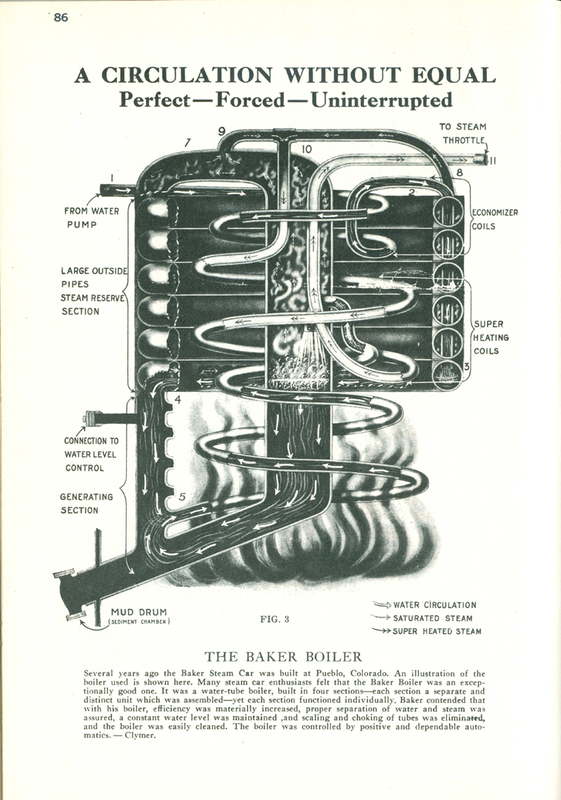 Baker made a burner for home heating. This tin sign promotes the burner and carries a location for dealer business cards. Note the company name at the top. 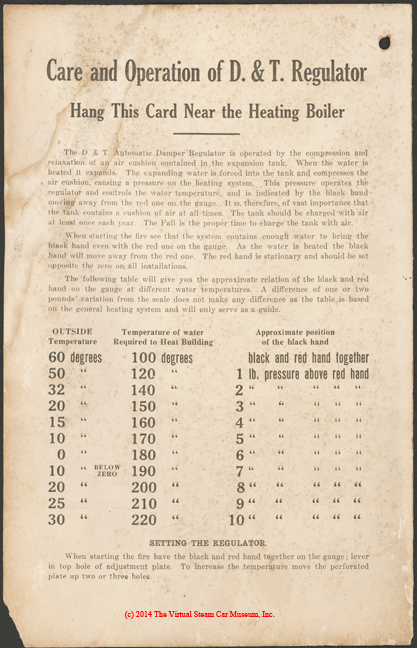 This two-card advertising piece came with the tim home Heating burner sign. This advertisement is found in Floyd Clymer's Steam Car Scrapbook, (1945, Bonanza Books, Crown Publishers, Inc.), p. 86. As with almost all of the illustrations and material in his Scrapbook, (a very appropriate description). This is the front page of a four-page trade catalogue that Clymer reprinted. 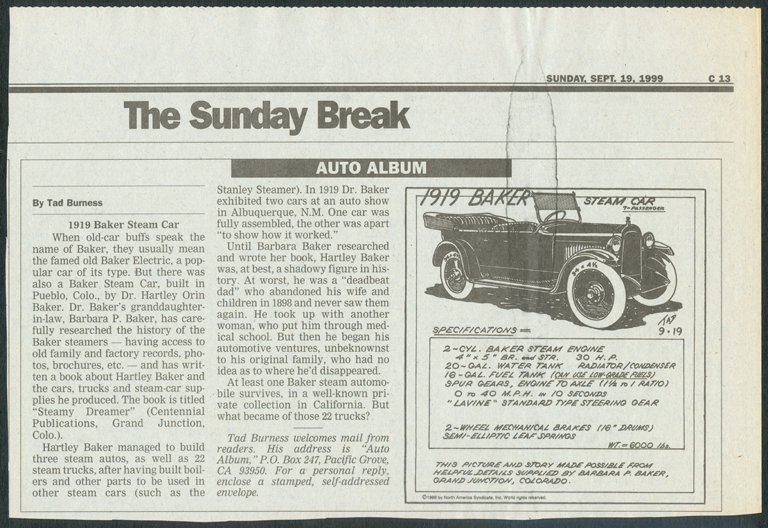 This newspaper feature appeared on September 19, 1999 as part of Ted Burness' Auto Album series. He cites Barbara Baker, the author of Steamy Dreamer as the source of his information. Georgano, G. N., Encyclopedia of American Automobile, (New York, E. P. Dutton & Co., 1968), p. 24. 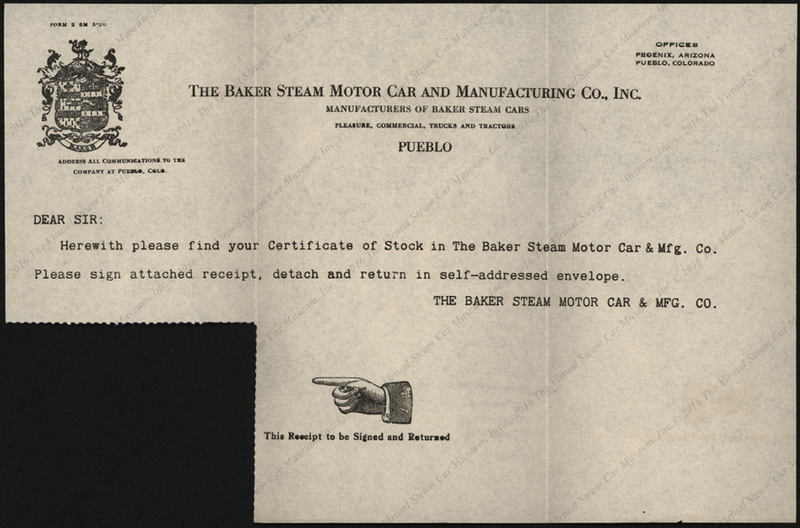 Contact us if you have additional information about the Baker Steam Car and Manufacturing Company, or if you have questions. 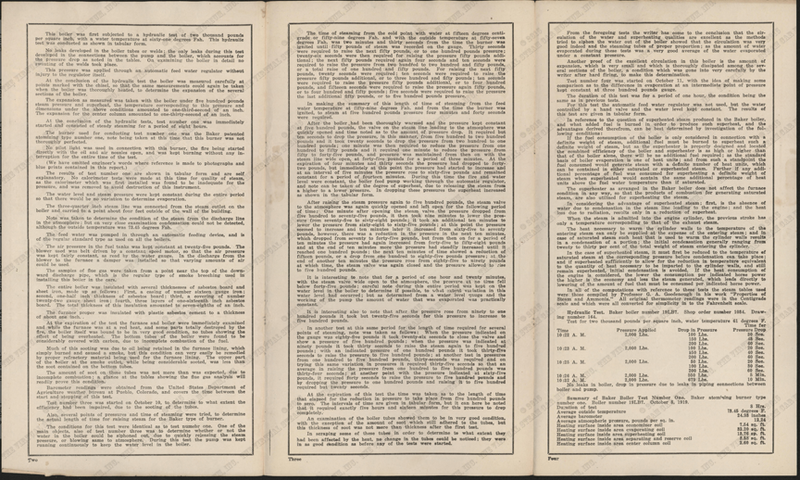 This web page took thirty to fourty hours to scan, research, and design. Thank you for supporting the Virtual Steam Car Museum!